The ABPG through its members seeks to promote road passenger transport, through the acquisition and restoration of vehicles manufactured and / or have been in service in Northern Ireland. 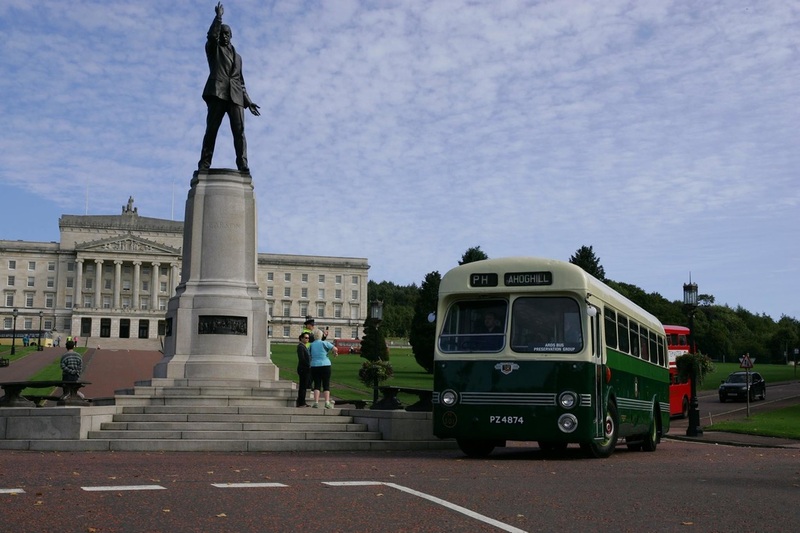 In doing so, it additionally seeks to educate the wider public to the contribution such vehicles have made to the economic and social history of Northern Ireland. Below are a few of our vehicles and a brief history and run down of them, please feel free to browse through our site and the history of the buses and coaches. 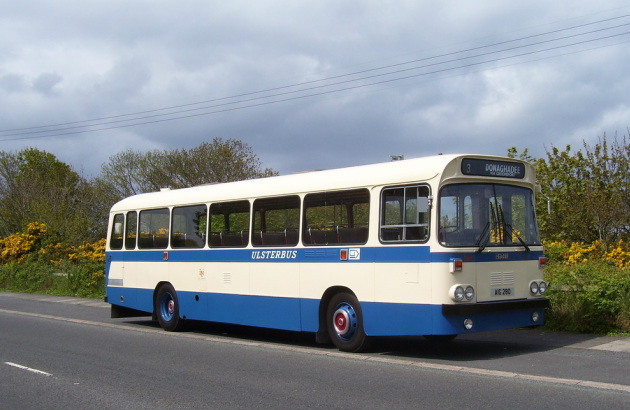 Leyland Leopard, ex Western SMT and Ulsterbus 1886. The ABPG has amassed quite a few Leyland Leopards in its collection and are quite the mainstay amoungst enthusiasts in the UK. Many of the examples we have, have been bodied in Belfast at the Alexanders of Mallusk factory for Ulsterbus. Two though, have been bodied with this Alexanders of Falkirk body. This particular example was new to Western SMT in Scotland. An unusual purchase maybe, but mid life it hopped across the Irish Sea to join Ulsterbus. It was mostly used by the training school of Ulsterbus and differed in having a manual gearbox as opposed to the standard semi automatic setup that Ulsterbus preferred. 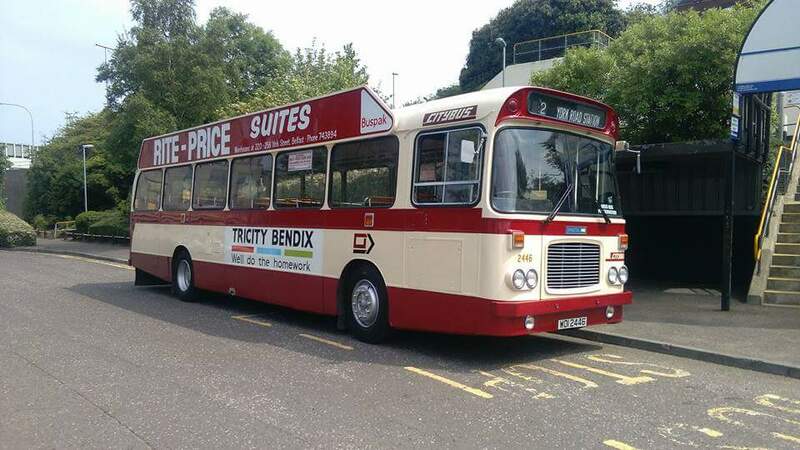 ​One of the groups five Bristol RE's and originally an Ulsterbus, this one dating from 1980 has been restored to Citybus livery of whom it operated for in the latter half of its service life. Sold to a school in Belfast after its service life was over, it was acquired by one of the groups members who has fond memories of travelling to school on it. Pic Matthew Wilson. Bedford YLQ, ex Ulsterbus 1878. ​Leyland Leopard, ex Ulsterbus 280. ​Pictured here in glorious sunshine and looking very smart after the completion of painting, is one of the groups many ex Ulsterbus Leyland Leopards. This particular example was new to Antrim depot and finished its days in Bangor depot and dates from 1982. It was purchased for preservation to represent the batch of bus seated Alexander bodied X types that had chassis that were diverted from the National Bus Company in England. Bristol LH, ex London Country BN33 & Ulsterbus 1893. 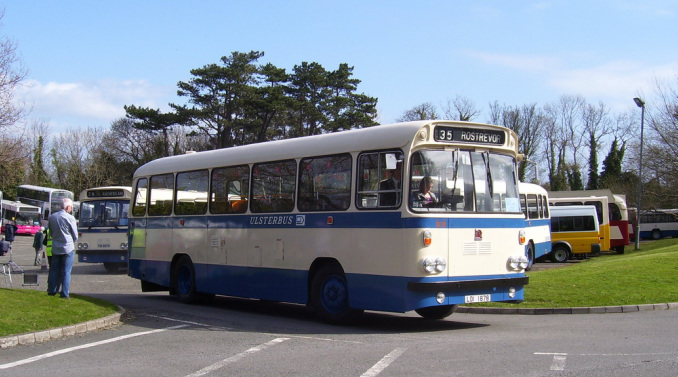 Leyland Tiger, ex Ulsterbus 1025. The group has eight Leyland Tigers in its collection dating from 1984 to 1991. 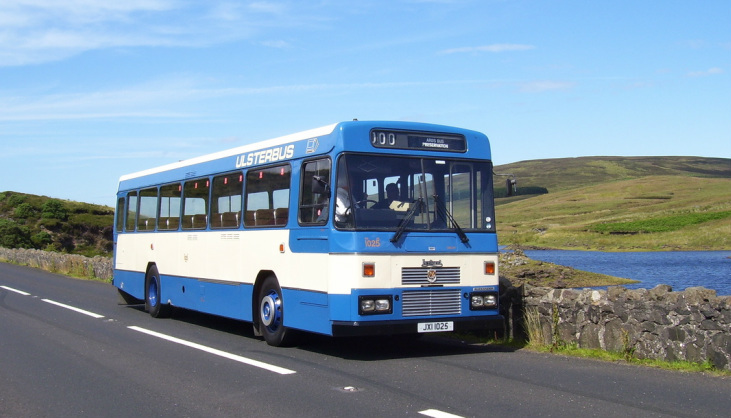 Pictured here is a 1987 example of a small batch of 30 that were delivered to Ulsterbus in 1986/87 and now is the sole surviving example of this batch. Allocated new to Newtownards, it was to go on to spend its whole service life at this depot before being acquired for preservation in 2008. It has been returned to the livery it wore when new. Leyland Tiger, Ex Citybus & Ulsterbus 2644. One of three minibuses in the collection, this one dates from 1990 and operated for the now extinct Flexibus Limited. Having had a substantial restoration from top to bottom, it is now considered to be the only restored Flexibus vehicle in existence. ​Leyland Tiger Cub, ex Ulster Transport Authority H8995/H301. Leyland Leopard, ex Ulsterbus 235. ​One of the founding members of the group and a vivid Leyland Tiger enthusiast, the group had this trophy put together as a lasting memorial in his honour. Appropriately made from a Leyland Tiger accelerator pedal, it is to be awarded at the annual Irish Transport Heritage rally to the best preserved vehicle of an independant judges decision.